Fresh data from Montgomery County Public Schools show in detail the staggering number of drivers who break the rules by speeding past stopped school buses that are picking up or dropping off children. WASHINGTON — Fresh data from Montgomery County Public Schools show in detail the staggering number of drivers who break the rules by speeding past stopped school buses that are picking up or dropping off children. Figures released this month show that 15,446 drivers were ticketed over the course of the latest school year, 2016-2017. That is compared to fewer than 3,000 tickets issued during the previous year. When school buses have their red lights flashing and children are exiting or entering the vehicle, Maryland law requires drivers traveling in the same direction as the bus to stop. Motorists approaching the bus from the opposite direction must also stop unless the two sides of the roadway are separated by a physical barrier, such as a median. The fine for each violation has been $125, but that is going up to $250 starting in July. “We just can’t believe how many times our buses are passed,” said Watkins. 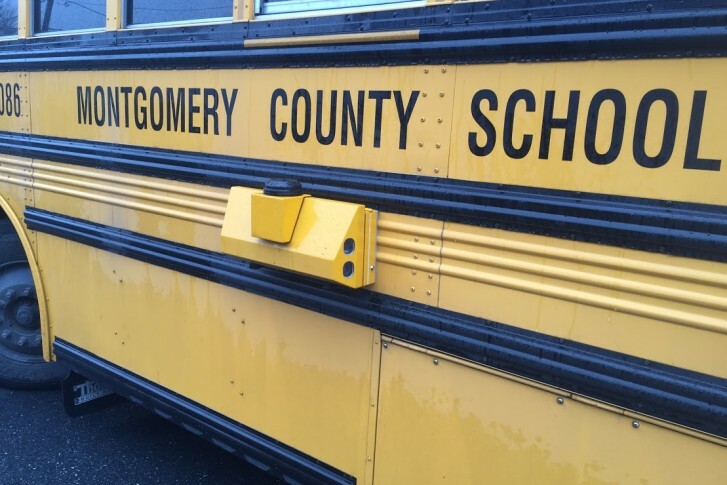 Drivers pass Montgomery County buses illegally between 800 and 1,200 times every day during a typical school year, according to the school system. “They don’t have time, in their minds, to stop for buses, particularly where they think there won’t be any students crossing,” Watkins said. The major reason behind the dramatic rise in citations comes from an increase in buses equipped with cameras. The county’s school system now has 217 buses with cameras, compared with just 25 in previous years. By the middle of 2019, the school system hopes to have cameras on its entire fleet of nearly 1,300 buses. Law enforcement figures obtained by Bethesda Magazine show that most tickets are given out on East West Highway between 16th Street and Georgia Avenue. Other hot spots include River Road near Little Falls Parkway; Bel Pre Road in Aspen Hill, and Colesville Road and 16th Street in Silver Spring.